I’m starting to get the feeling social games on Facebook and other social media sites are like bad relationships, which is the antithesis of what social games are meant to be. I’ve not tried too many because before I get in many of them I’m bombarded with invites, messages, and people begging for help before I even get into the game. SimCity Social by Electronic Arts was something I decided I should try because I love almost everything “Sim.” I have played all the SimCity series, SimAnt, SimEarth, The Sims, and so on. 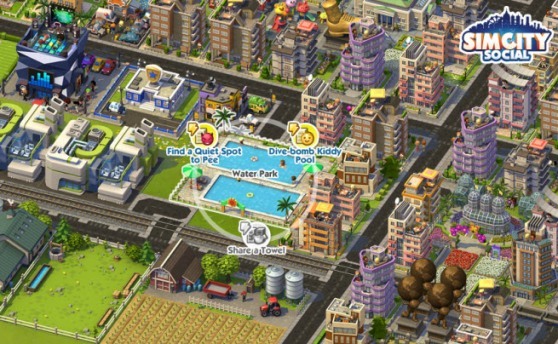 So I thought maybe I’d give SimCity Social a try. I quit within the hour. You can’t see the straps on the arm rests designed to keep you here forever. When the game began I was immediately met by my assistant who told me what I needed to do to get started. It was a brief tutorial period which taught me the basics such as building a house or two. I also built a park. Once I completed my brief tasks I was given a mayor’s house as an award. I was asked to share my new award with friends, but I opted out of this option as I was still trying to figure out if this game was worth it. I built it by the river so I could enjoy some fishing in my downtime. I’m that kind of mayor. Forget my citizens for a nice catfish. I also leveled up. At first I thought that was kind of weird, since I haven’t really encountered that before in any of the Sim games, but I went with it. I assumed it was some kind of unlocking mechanism. The game again asked if I’d like to share. I appreciate the request to share versus auto-sharing, but I literally had closed another sharing opportunity minutes before this. I grunted softly as my index finger pressed down on the mouse button. I noticed immediately my assistant was really no assistant at all. She was my boss. She constantly gave me tasks to complete rather than “assisting” in my goals. Build a business, five houses, and upgrade your park to level two. I did that. I gained a level, and she gave me more tasks. There was a sense that I really wasn’t in control of my city. I wasn’t granted the freedom to make my city how I really wanted without jumping through some rather “on rails” hoops. Furthermore, every action had an equal and opposite request to share. “Friends” began moving into town. I had the option to send them gifts for doing so. 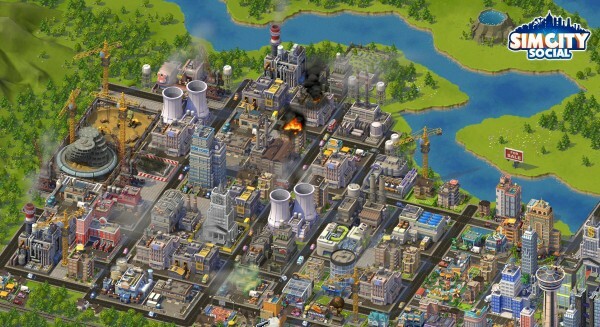 The thing is, the friends that were moving in were 99.99% likely to not be playing SimCity Social at all. I confirmed this suspicion by looking through my friend list. I wondered if I sent them a gift in the game if they got a random Facebook wall post that said, “Brandon is sending you this digital gift for a game you don’t play! Play the game, and you get the gift!” It felt like I was sending them Facebook herpes. Starting to question the effort to get to this point. The game introduced an NPC, Don, so I could visit his town and see how I can interact with friends’ towns. The town was supremely better than mine, but I got the sense as I saw the buildings that were available that the cost to get to this point was really going to dip into my social capital with my online friends. I needed my friends to be online and constantly nag each other to get this kind of city. I wasn’t going to be able to roam free as a mayor. I was being assimilated before my very eyes. Furthermore, an event happened. A UFO crashed just outside of my city. I was given tasks on how to investigate it and unlock its secrets. In order to do so I had to spend the jewels I was earning. I also had to hire staff. Staff cost jewels. You get one jewel per level or major development. I had too few jewels to partake in such event. In order to get more jewels, I had the option to beg ask my friends for the jewels I needed to hire the staff to research the UFO, or I could buy some. I could tell my tenure as mayor was on life support. Analogous with the burning bridges of my lost friendships had I pursued. I closed down the application, went to my account settings, and removed SimCity Social. What started out as optimism and hope quickly sunk down to the viral nature of almost all social games that exist to this point. An article on Kotaku suggested what makes a good game is choice. I felt there was no choice or true decision-making in this game. This was disappointing because that’s what SimCity and all other games of this breed were about. How do you want to run things? What do you want to create? Not once within the first hour did I get that feeling. It was more like, “Who do you want to bug?” It also raised some concerns, founded or not, for the upcoming SimCity. I’ll admit, I invited a couple of friends from Horrible Night to try the game out, but even before they got a chance to log on, I was done. While it may have been a little more fun with companions, it is a social game after all; I still didn’t get the sense of choice or control. I felt I was pulled along, willingly or not, and just given a set of staged tasks that didn’t really give me anything in return of value. This was like any social game on Facebook, and until the formula changes, I will likely not venture back into that relationship. Tried It – Reaching outside of our comfort zone, Tried It explores the games and genres that our author doesn’t normal play and has little experience with. I couldn’t have said it better myself friend. You got out before the game could get its hooks into you, which is key. One does not want to have an experience like I did with Cityville where you make fake facebook accounts to feed the addiction! Thank you, I’ve recently been looking for information about this topic for a while and yours is the greatest I’ve came upon so far. However, what in regards to the bottom line? Are you sure about the source?|What i do not realize is in fact how you are no longer really a lot more smartly-favored than you may be right now. You’re so intelligent.